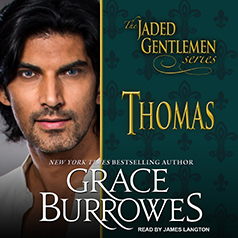 New York Times bestselling author Grace Burrowes presents the first installment in her Jaded Gentlemen series. Contains mature themes. Thomas Jennings arrives to his newly acquired estate to find that his steward has fled under a cloud of scandal, and the property has been held together by Miss Loris Tanner, the steward's daughter. Thomas knows what it's like to not fit in, and he's pragmatic enough to respect results, so he gives Loris a chance to maintain her position in a profession uniformly undertaken by men. Thomas learns about the complexities of estate management from his unlikely tutor, despite somebody's attempts to drive him off his own land. Mishaps turn into near tragedies, while between Thomas and Loris, respect and liking grow into attraction. Who is sabotaging Thomas's estate, and what choices will Loris face when the malefactor has been revealed?